Travel back to April 10, 1912, the day the RMS Titanic sailed on her maiden voyage. After years of planning and construction the great ship was finally on her way to America and sadly, to a watery grave. On the 4th night at sea, the Widener’s of Philadelphia threw an elaborate dinner party in honor of the ship’s captain. A few hours later Titanic was sinking. Amidst the chaos and panic that followed, a shot was fired from the crowd and the ship’s Officer, William Garret, fell dead. Who Done It?…That’s where the intrigue and a new Tour Group marketing opportunity at The Titanic Museum Attraction in Branson, Missouri begins. While touring the museum, your group will try to solve the crime. This new Titanic experience gives your groups a fresh, new and unique experience that actually puts them into the act. Since nobody has been able to get to the bottom of this dastardly deed, only the wit and wisdom of your amateur detectives can solve the crime. Following a greeting by First Class Stewardess Sarah Stap, your tour groups will be guided and delightfully mislead through the entire event by an enthusiastic and colorful Titanic cast and crew. Each of your guests will assume the name of a real Titanic passenger (dress up is encouraged as it adds to the experience) as they begin their search for clues throughout the ship’s galleries. In the end, the Who, How, Where, When and Why Officer Garret was murdered will be revealed. But remember, the killer has been amongst your group all along. The Titanic Mystery is designed as a lighthearted escape for your vacationing guests and as an engaging team building exercise for your business clients. All of the excitement and action unfolds against the sumptuous backdrop of the world’s only multi-million dollar recreation of the original Titanic. 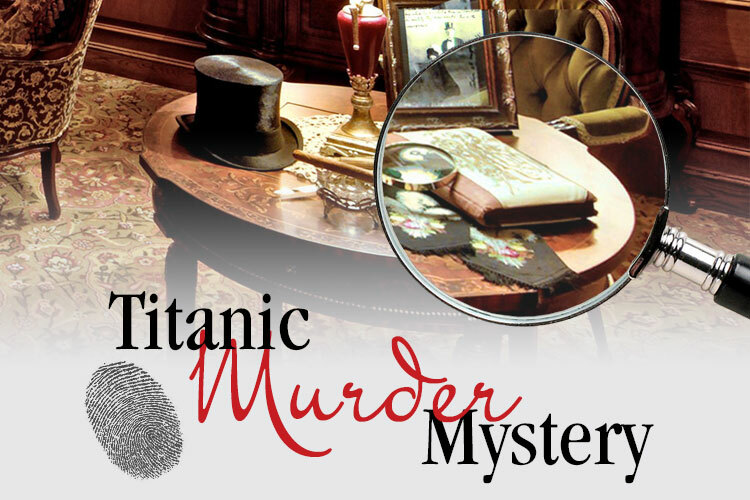 Murder Mystery Tour – Available one hour after Titanic closes. Space is limited, call today to book your group!